AUTOMATE-200 is SMC International Training’s response to the increasing demand for the introduction of a technological culture in training centers. Using a recycling plant for solid urban waste as a reference, a fully modular design system has been developed for a training environment. The integration of the technologies in automated processes brings familiarization to the user of this fascinating world. With this system, the student uses an integrated and motivating context to become familiar with technologies such as pneumatics, sensors, electric motors, PLCs, etc., in an enjoyable and intuitive way. Using completely industrial components we develop skills in analysis, troubleshooting, designing, creating technical documentation, setting up/commissioning, understanding technical documentation, operation and programming. AUTOMATE-200 includes up to ten functional blocks that can produce an infinite number of configurations, emulating different processes and making it possible to perform an endless number of activities with different levels of difficulty. The raw material used in the process includes parts with different colours (light/ dark), materials (plastic/ metal) and shapes (with or without hole). During the last phase of the process, the parts are sorted and stored in containers. • AUTOMATE-200A: Instant connection wiring! • AUTOMATE-200B: Take it wherever you want! • AUTOMATE-200C: The most compact in the range! Common elements in all versions: Power supply, air treatment unit, anodised aluminium structure, control keypad, solenoid valve block, labels for cables, speed controllers, control PLC*, user manual and practice manual and Multimedia CD. 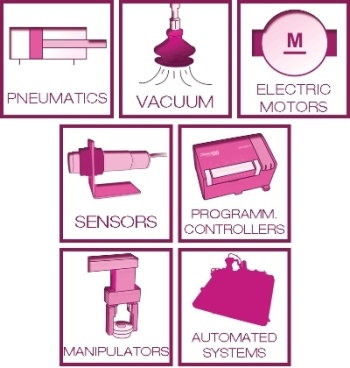 *Options: PLC Omron, Allen Bradley, Mitsubishi or Siemens.